This easy-to-sew, loose-fitting dress has loads of relaxed, elegant style. It includes bust darts for gentle shaping, forward shoulder seam, optional on-seam pockets, and bias neck facing. View A has short kimono sleeves and a below-the-knee length with a wide, wrap-around sash. 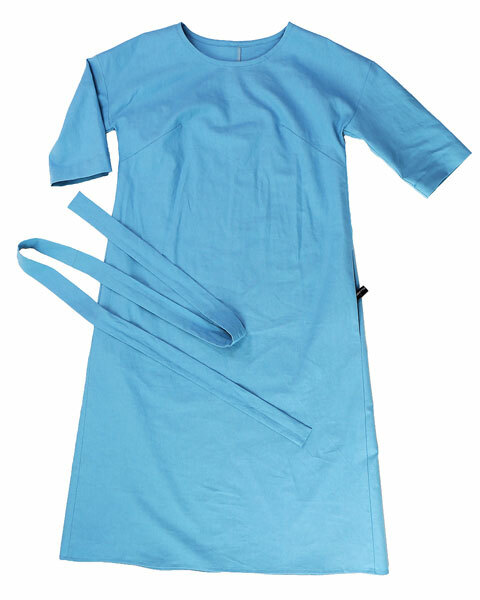 View B includes 3/4-length sleeves, midi-length skirt, and a tie belt. 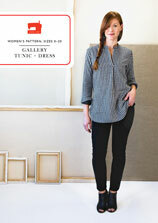 Share your photos on Instagram with the hashtags #lcterracedress and #lieslandco. This style is provided as a digital layered PDF pattern that allows you to print only the size(s) that you need. It may be printed on both home printers (using either 8 1/2" x 11" or A4 paper) and at service bureaus that handle 36"-wide or A0 sheets. When you complete your order, you will be provided with a unique code to instantly download the pattern. See our digital product policy for full details. This easy-to-sew, loose-fitting dress has loads of relaxed, elegant style. 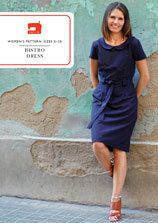 It includes bust darts for gentle shaping, forward shoulder seam, optional on-seam pockets, and bias neck facing. View A has short kimono sleeves and a below-the-knee length with a wide, wrap-around sash. 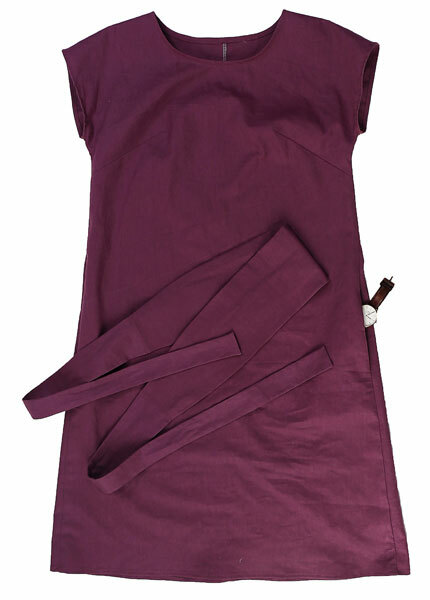 View B includes 3/4-length sleeves, midi-length skirt, and a tie belt. With no buttons or zipper to sew, and with detailed instructions for how to complete a full-bust adjustment, this pattern will enable even beginning sewists to make a perfect looking and fitting dress. This pattern works best with light- to medium-weight woven fabrics with some drape like linen, double gauze, rayon, shirting, and quilting cotton. Coordinating thread, featherweight or lightweight fusible interfacing. Chest 38 1/2" 40 1/2" 42 1/2" 45 1/2" 48 1/2" 51 1/2"
Hip 45" 47" 49" 52" 55" 58"
View A Length* 42" 42 1/2" 43 1/4" 43 3/4" 44 1/2" 45"
View B Length* 47 3/4" 48 1/4" 49" 49 1/2" 50 1/4" 50 3/4"
* Measured from shoulder at neck. XS 33 1/2" 26" 36"
S 35 1/2" 28" 38"
M 37 1/2" 30" 40"
L 40 1/2" 33" 43"
XL 44" 36 1/2" 46 1/2"
XXL 46" 38 1/2" 48 1/2"
The dress went together quickly and looks very professional. I love it! I did some blending between sizes to fit my pear shape XS at bust, M at waist to XL at hips (will probably go to a L at hips in the next version). Would be great if the pattern was set out to fit on an A0 size, or even 2 x A0 (841mm x 1189mm). It's too big to print on a standard plan printer. Looking forward to sewing it this weekend though. The PDF file does, indeed, include A0-sized pages. There are two sheets, and you'll find them on pages 61-62 of the PDF file. You'll note that the pattern pieces for this dress are too large to fit on a single A0 sheet, so you'll need to combine the pieces after you have the A0 pages printed. Went together really well, clear instructions and accurate fit. Need to make another now! I really enjoyed working with this sewing pattern. I made View A and I absolutely love it. Ever¡thing in the pattern comes together nicely, and, as with any other pattern from Liesl, you get the extra bonus learning some techniques to make it look good and professional on the inside too. I absolutely recommend it. A winner. 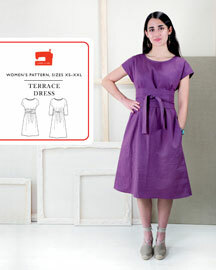 Discussion on the digital terrace dress sewing pattern from the Oliver + S Discussion Forums. A selection of your photos from the Liesl + Co. Flickr group. Find and share more photos on Instagram using the hashtags #lcterracedress and #lieslandco.